All speakers in the picture above are the same: The SQ-50H. Autumn 2016: New filter, top quality audio capacitors and input conjugate link for even better performance. Cabinet size, outside dimensions: H 120 cm, D 280 cm, W 23 cm. Tall and slim, the drivers will be at approximately the same hight as your ears when sitting down. 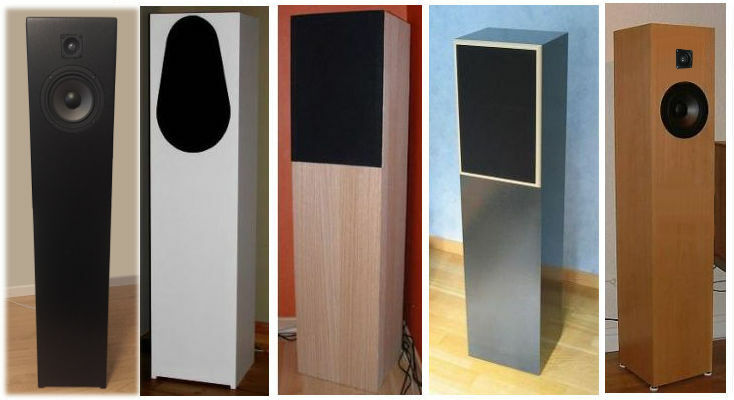 The lower (80 cm) variant of the same loudspeaker, click here. We do not recommend using the instructions below for practical use, even if you can print them yourself. We take no responsibility for the result you get using these drawings and instructions. So, wait for the printed instructions supplied with the speaker kit before starting your project. You start off with a 2500 x 1200 mm 16 mm (5/8 inch) piece of fibreboard, the low-cost type with a hard surface and more porous inside. This material dampens resonances well. One board is enough for two boxes. Now cut out the holes for the speaker drivers on the fronts (180 x 1160 mm) See the drawing. The woofer cutout is 149 mm in diameter, center of the hole 200 mm from the upper edge of the front. Also drill holes for the speaker contacts on the back of the box, preferably right behind the woofer, so you can easily reach it through the woofer hole if something happens like a soldering getting loose. The parallell 45° lines indicate where the damping material is applied: Front, upper part, back and inner piece. The grey area is the damping material on both sidewalls. A reliatively light dampening material is enough. If you happen to have an IKEA warehouse nearby, the very cheap "Myskgräs" does the job very well! Otherwise: 100 - 120 g / sqm polyester wool. Tweeter: Hole center 50 mm from the top of the front piece, diameter 48 mm. Woofer: Hole center 200 mm from the top of the front piece, diameter 151 mm. Start by putting one sidewall (1200 x 260 mm) on a flat surface. 1) Lid (180 x 230 mm). 4) Bottom part (180 x 230 mm), make sure it gets parallell to the lower edge of the sidewall. That is, horizontal when the box is standing up. 5) Inner part (180 x 100 mm). There should be a distance of 60 mm (+/- 3 mm is OK) between the bottom part and the inner part. This is the bass port, surface 60 x 180 mm, length 116 mm. Cover the front, from about 85 mm from its lower end up to the woofer. Cover the sidwall you started with, but only down to about 115 mm from the bottom, se gray area in the drawing. The correct drawing is included in the kits you buy from us.